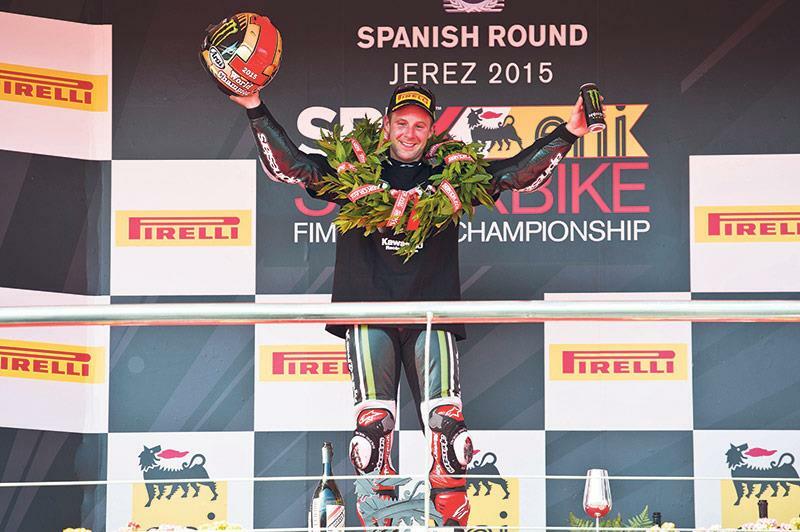 With the dust settling on his title-winning celebrations in Jerez, Jonathan Rea has finally had time to reflect on the fact he’s joined an illustrious list of WSB champions – including fellow Brit Carl Fogarty. ea explains; “It’s only just sinking in,” after arriving back into Northern Ireland following the Jerez WSB. Rea paid a fitting tribute to his past heroes by donning actual helmets worn by Dunlop and Reid as part of a perfectly choreographed celebratory cool down lap in Jerez after clinching the title in race one. Ironically Rea’s title-winning weekend proved to be the most difficult of his 2015 season. His two fourth places were the first time in the opening 12 races that he had finished off the podium. Rea has been in WSB full time since 2009. Even as a rookie he was fast, beating far more established and experienced team-mates Carlos Checa and Ryuichi Kiyonari. In fact Rea has never been beaten by a team-mate in seven years of WSB. But beating your teammate isn’t enough to secure your legacy unless you are Jorge Lorenzo or Valentino Rossi in MotoGP this year. “I was always the nearly guy. Yeah I could win races, but guys like that don’t get remembered,” he says. That elite group of fellow WSB champions continues to grow into an ever more eclectic mix of greats. From Doug Polen to Fred Merkel, Scott Russell, Carl Fogarty, Colin Edwards, Troy Bayliss, Carlos Checa, Ben Spies and Max Biaggi to name a few. More of the same in 2016? There may be four races left to run in 2015, but the top WSB teams have already begun preparations for 2016. Suzuki have a new GSX-R, Yamaha are back with their formidable R1 and Ducati have shown that their Panigale is well and truly up to speed having won five races so far this season in the hands of Chaz Davies. And Kawasaki have a new ZX-10R for freshly-crowned champ Jonathan Rea, who told MCN: “We’ve got a new bike for next year and we’ve already been testing some revised parts and that gives a lot more motivation. I’ve never been in a position when the season is still going, to start thinking about the next model coming. Jonny Rea and his odd looking cooler fixed to his back at Cadwell this year.